remote Creekwood Lake. 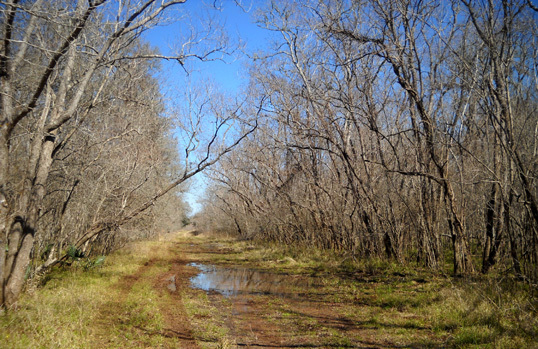 This trail is sometimes closed due to wet trail conditions." The first 1/3 mile of this trail was so wet last year that Jim and I weren't able to continue any farther on foot, let alone on a bike. It was closed to all trail users the whole month of March. I am always curious about trails that are new to me, and even more determined to explore this one because of being unable to see most of it last year. The only way to access Creekwood is via the Bayou Trail (shown in blue), which is also sometimes closed to foot, bike, and/or horse traffic if it's too muddy. 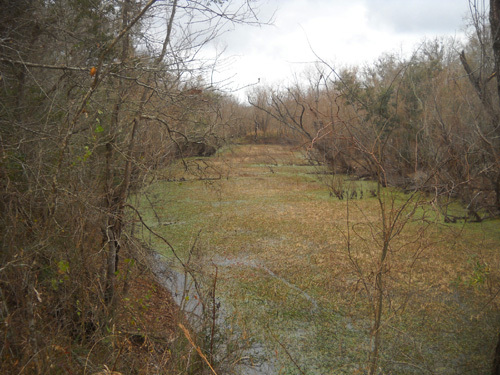 Currently Bayou is open to all trail users but Creekwood is closed to equestrians. In my opinion it's not ready for bikes quite yet, either. Last Sunday I hiked in 1� miles, then turned around because I didn't have enough water for Cody and me on a warm, sunny day. 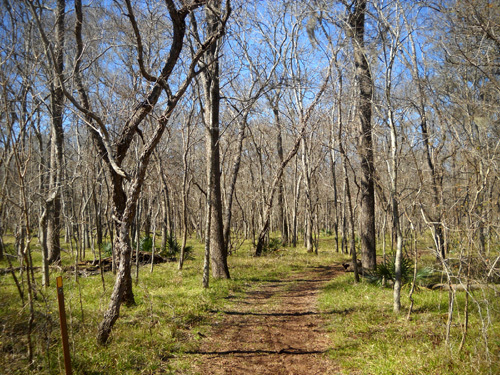 We'd already hiked several miles on other remote park trails before approaching Creekwood. This first series of photos are from that hike. Wild pigs had been digging up the dirt on and near the trail in that area but I didn't see any of them that day. That hike just made me want to see the remaining mile and a half of the trail to the park boundary. I'd have to wait until I had the time and energy to do at least a 10-mile hike, however. This isn't a trailhead to which you can drive. I got my chance one morning this week. 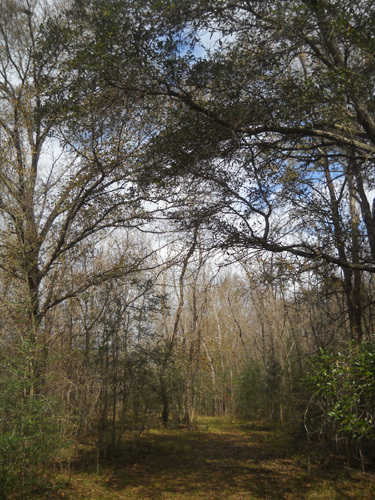 The bad news is that the pictures from my second hike on the Creekwood Trail aren't as pretty because it was an overcast day. The good news? Since we haven't had any more rain the trail was a little bit drier than it had been four days earlier. I still had to bypass the three wet areas in the first 3/4 mile but I could tell they were improving. 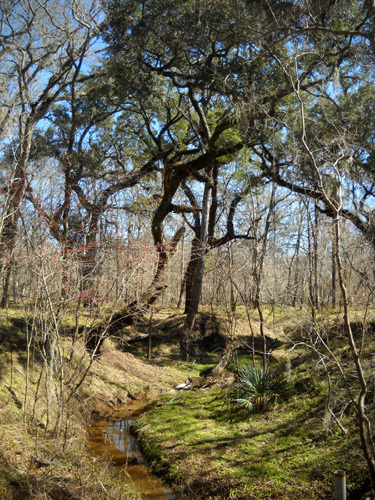 The next four photos are from this hike; they are scenes from the second half of the Creekwood Lake Trail. When I approached the field the pigs have been digging up I was rewarded with seeing a couple dozen hogs in the woods and the one ahead on the trail that I showed in the last entry. Father along the trail I could see other areas where they'd been digging. This is the most remote part of the park and a good place for the pigs to stay so the rangers are less likely to "relocate" them (you don't want to know). Cattle from neighboring ranches also occasionally manage to find their way into this area but I didn't see any of them. A little past the pig field the trail comes very close to Big Creek and you can see the 200-loop of the campground across the deep channel cut by the creek. You can see it on the map at the top of this entry. Too bad there isn't a bridge across the creek so more folks could access this trail. It would have to be a major bridge, however, because of the serious flooding that sometimes occurs. No, you wouldn't want to ford the creek. Alligators, remember? 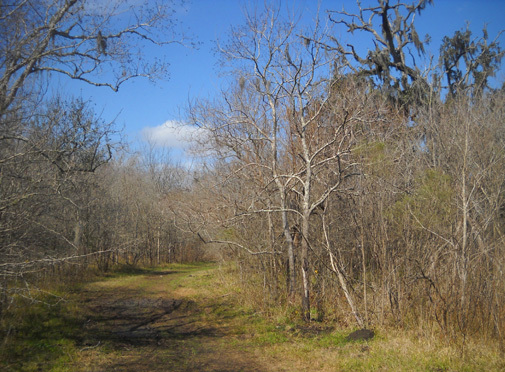 The trail became more open and grassy near the park boundary about a quarter of a mile beyond the lake. I turned around and retraced my steps 3+ miles back to the trailhead at Bayou Trail (and another couple miles back to our campsite). 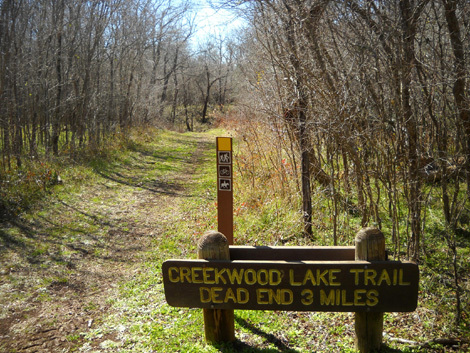 It took Cody and me about 3� hours to hike a total of ten miles; my GPS indicated we were on the Creekwood Lake Trail (round-trip) for 6.6 miles of that. I like this trail and I plan to come back on my bike if the weather continues to be dry for a while. 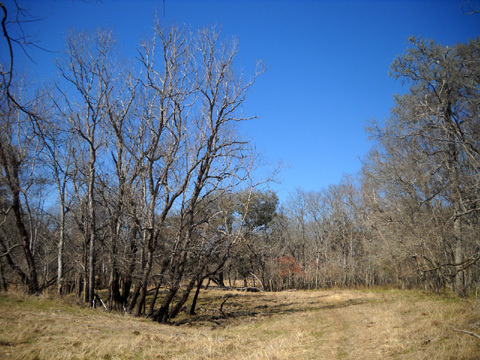 It's an interesting trail to hike, run, bike, or ride a horse -- when it's dry enough. 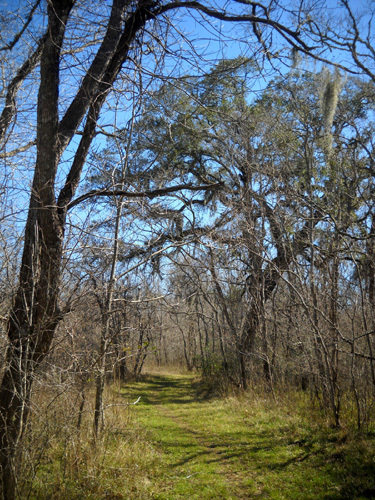 By now I've hiked or ridden every trail that's currently open at Brazos Bend. 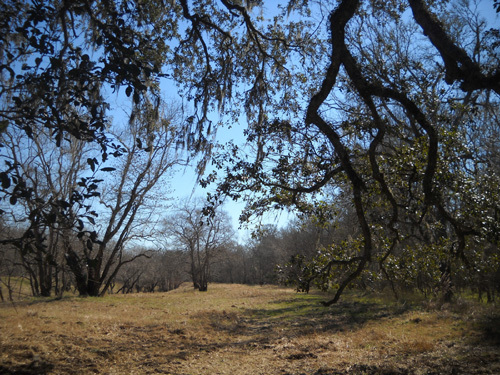 That's about 34 miles of trails, with 1� miles on Live Oak still closed to all trail users. 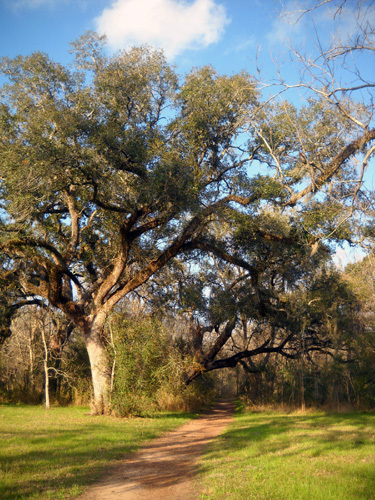 Rangers have begun to spread crushed rock on Live Oak but they reportedly need to come up with another $22,000 worth of rock before they can complete the job. Money like that isn't easy to come by when the state of Texas has a serious budget deficit. I doubt that project will get done this year. This past week I've walked 21 miles and biked 34 miles, mostly on trails. One of those rides was 20+ miles, another 13+ miles. 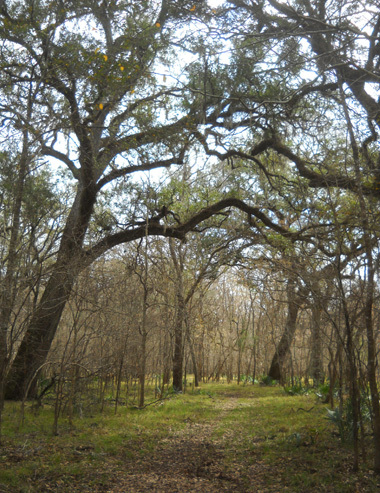 In addition to the pictures in the last two entries, here are some of the other trail photos I took. 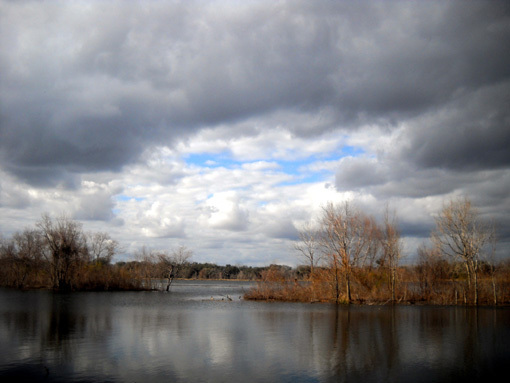 My favorite trails to hike and bike are the ones around and between Elm and 40-Acre lakes. I love the water, birds, and alligators. During the week there aren't many other folks using the trails. 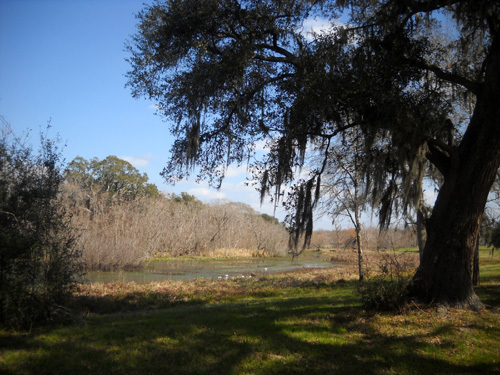 Jim and I have both learned to avoid the lakes on weekends -- when the hordes descend on Brazos Bend -- unless we're in the mood to saunter and talk to visitors instead of getting in a serious workout. 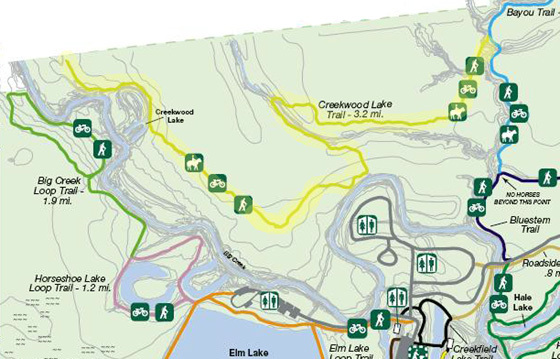 Two trail loops that begin off the NW side of Elm Lake are shown on the map above. 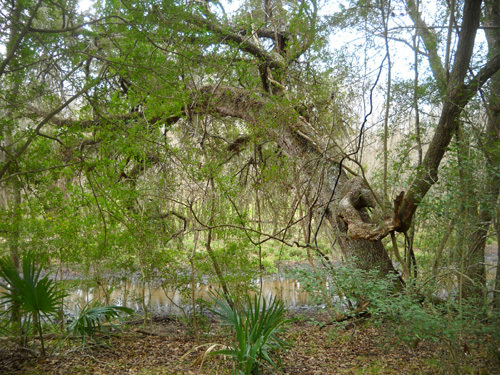 The 2-mile long Big Creek Loop Trail runs off the far side of the Horseshoe Lake Loop Trail. It is marked in green on the map above. 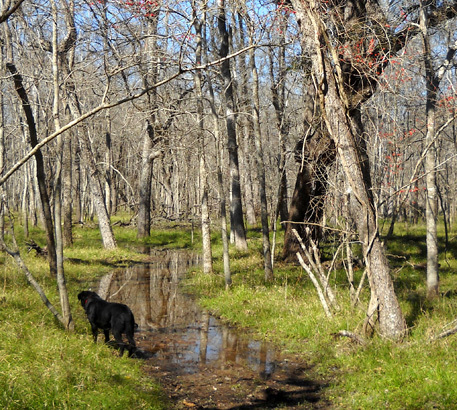 Last March this trail remained fairly muddy in spots and we didn't run on it much. Last week Jim reported it still had some mud in a couple places but was in better shape than we ever saw it last year. That was enough to get me out there! The rest of it was dry. That photo doesn't show the double-track grass-and-dirt trail; I was standing on it when I took the picture. 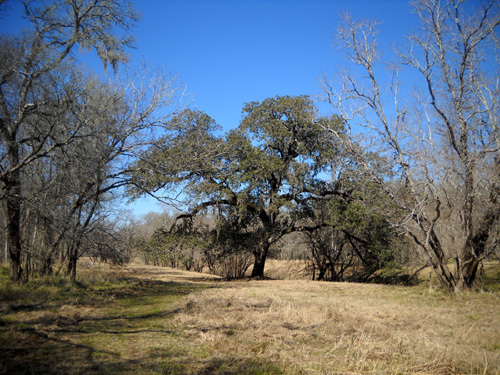 One of the trails closest to our campground is the Roadside Trail, which runs from Creekview Lake past the George Observatory to the Hale Lake picnic area. 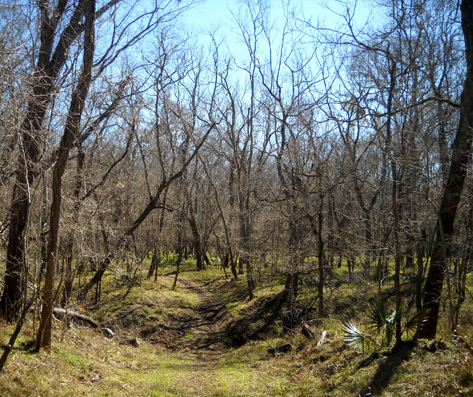 It is marked in tan and is in the lower right corner of the partial trail map at the top of this entry. The trail is a little less than a mile long. It is smooth dirt, flat, and about three feet wide. 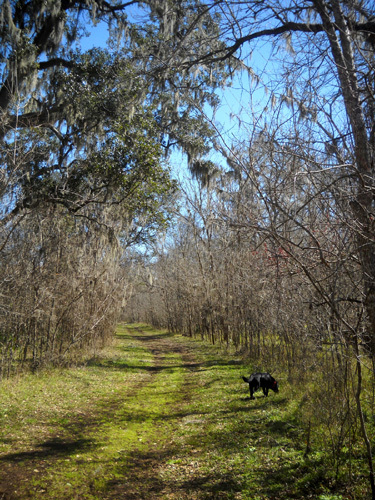 Another trail I often walk or ride is the Bayou Trail, shown in blue on the map above. 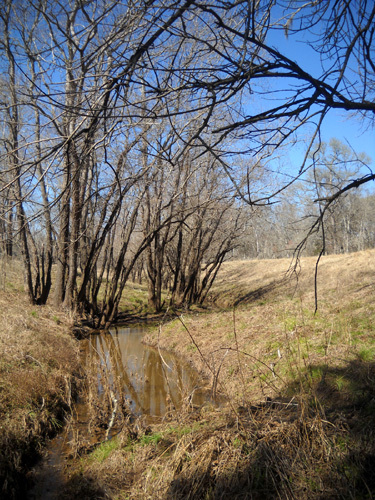 It's a 1.4-mile dirt and grass trail that connects the Bluestem and Sawmill Trails. 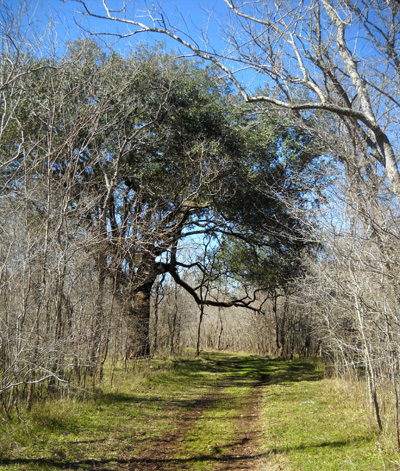 It also has the only access to the Creekwood Lake Trail. The Bayou Trail was a little muddy last week. The first time I walked it I spent a couple of hours clearing limbs and dragging small trees out of the path. That wasn't totally altruistic or as part of my camp hosting duties; I also wanted it clear to ride my bike! Now it's not only cleared of debris, it's also dry enough for bikes and horses. 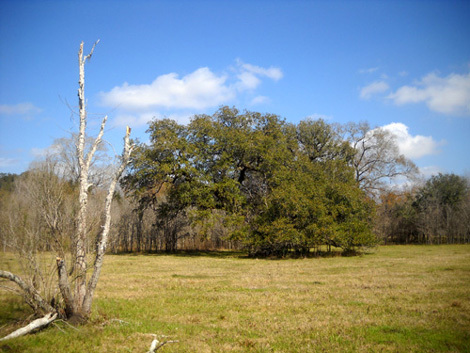 I've also cleared limbs from the Sawmill Trail, which runs 2� miles along Sawmill Road between the Bayou Trail and the equestrian campground (EQ). Most of that flat, wide, double-track dirt and grass trail is dry but there is enough mud in one place that it's not open yet to equestrians. I'll continue to show photos of these and other trails in subsequent entries.